Added in 2017: This page has, quite unexpectedly, become the most viewed page on this site! Our summary advice for any small business owner (sub £2 million in turnover) is to not use a business transfer agent or broker to sell your business. You're better off handling the sale yourself. If you still feel you need a business broker, or you own a larger business, here's how you find the right broker. While there are many honest and competent brokers around – and a good broker is worth many multiples of the fee charged – the volume and nature of complaints reveal an industry where unfair contract terms, exploitation and downright deception are quite common, even with some of the best known names in the industry. Unfortunately, first time sellers of small (sub £2 million turnover) businesses usually end up with the worst business brokers. That's partly because at this end of the market brokers tend to offer what looks like a no-risk proposition: "pay us no fees (or very low fees) at the start with the bulk of the payment only when we sell your business". This is seductive for inexperienced sellers and especially so when accompanied by the exaggerated business valuations these brokers provide. The prospect of getting a large pay-off without risking any (or much) money upfront is enticing for the business owner, but this is often a dangerous trap! Business owners falling for it can end up going bankrupt (as demonstrated by the numerous examples below). Yes, there are hundreds of thousands of results. 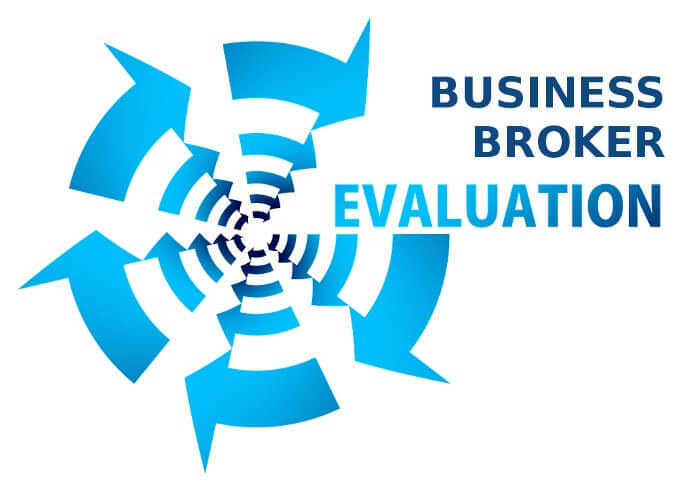 We've extracted some of the feedback from business owners who've used these brokers. Please find them below. These constitute but a small selection of reviews / complaints posted in just one newspaper's feedback section. There are, separately, thousands of extracts from court actions involving brokers, but they are not included on this page. For the purposes of this article, the terms business brokers and business transfer agents (BTAs) are used interchangeably. For legal reasons the names of specific brokers in the comments below have been obscured. ​If you want broker-specific reviews, our own detailed reviews of some of the best known brokers in the UK are on this page. We've covered brokers such as Knightsbridge (KBS), Intelligent Business Transfer (IBT), RTA Business Consultants, Blacks Business Brokers etc., ​and include information on these brokers that you won't find elsewhere. "After 25 years I took the sensible step and decided to stop trading and closed last week. M***** (brokers) were one of many people I called to inform of my decision and on Friday I received an “admin fee” final bill out of the blue for £4,000 ex vat." "…our company went into involuntary bankruptcy which I notified *** regarding this. They responded by not only taking My Old Company to court but also me too. My old company owed me £75K and also my house had 2nd charge on it by Bank, therefore at the present I am financially ruined…"
"Preferred commercial [broker now gone bust – editor] are an absolute joke, the silent partner Mr ***** used to own a company called SBS and went into liquidation then opened a business called bag of business, that business also went into liquidation and guess who their called now Preferred Commercial and apparently they are a second to none service"
"I put my business up for sale in good faith with a BTA, and had no offers as all the people sent to view had no money to buy it (this is despite the BTA promising they credit check everybody and ensure they have the funds in place before veiwing). So i gave them the 60 days notice they required to end my contract as my 12 months was up, and guess what??? I am being taken to court for ending my contract early, when it clearly states i wish to end it after my 52 weeks are up!!!" "My son fell foul of these nasty grubby little oiks. They took him for £5400. He lost his business, his home and self respect." "I now understand they operate a business model that is inherently designed to deceive clients. Any marketing they do undertake is solely to give the impression of credibility and a pretence they trade as a genuine agent. Their income is derived from fees supported by cleverly worded contracts which most do not examine carefully enough trusting instead to an element of good will." "Business models are all the same – glossy presentation, hard sell, asymmetric information, sign the contract and then … very little"
"My 12 month contract was coming to an end so i gave them the requested 60 days notice to terminate ( as advised by their staff) then received a bill for £4700! They are now trying to take me to court"
"…dismised them in 2005 now in 2009 they whant comission on a sale they had nothing to do with because of a clause in the small print that gives them the right indefnatley unless you follow there procedure to the letter whitch im absolutly sure ive done following the telephone dissmisal…"
"The salesman was the original snake oil merchant. He signed the contract on our premises which is in Cornwall and told us that is was just a normal contract and there were no hidden clauses and we shouldn’t be concerned." "I went with Preferred Commercial [broker now gone bust – editor] around july time, since then my business has gone insolvent and they are demanding £7000+ in fees." "Having already spent £750 with SBS Business Sales [broker now gone bust – editor] we agreed to see a k****** salesperson. Sure enough they took the business on their books without a fee upfront. What K****** didnt explain is that if we ever wished to take the business of the market we would have to pay them £1000. The service from both of these agents has been awful, frankly my nine year old daughter has more business acumen than the aggressive and unsympathetic staff that these two companies employ." "4.45pm on a friday night after a meeting the rep asked me to sign the contract agreeing that I have the weekend for my partner and I to look over it. 9am saturday morning I phone them and tell them no thank you and guess what, they are now threatening me legal action to the tune of £7000. I don’t know where to turn now, can anybody help? Is it worth contacting the office of fair trading?" "I had my buisness up with K****** for 7 months. they recommended advertising for £75000, 70k mine and 5k theirs when they sell the buisness. “what if you don sell it” i asked “no worrys if we dont sell we wont charge you” i thought fair enough if they can sell for 70k by all means take 5K. Now this is the sneeky bit there was 2 parts to the form…now they want 5k iv been to trading standards who cant nothing because it a trade to trade contract." "We were shocked at the very confident valuation, which was in the region on £170k when we only had 2 years worth of accounts one making a £8k profit and the other a £38k profit. It made us feel as if we would win the lottery if we sold. As soon as he left – which was within minutes of us signing! – I started to feel a little worried that the valuation was completely unrealistic. Within an hour I emailed the rep to advise we wished to withdraw from the contract and that we would not be paying the £1950+VAT set up fee(there was no number to call on)." "Totally digusting service, they took our business on totally overpriced, Linda the rep promised us the world and what do you know within 3 weeks we get a call saying were to expensive and tell us to drop our price. and were not allowed to come off the market because were conned into a contract with them for a year…"
"…all the volume business transfer agents operate the same policy. stack em high, sell em cheap. high cost, low value"
"…had the misfortune of coming into contact with ‘*** *********’ … disgustingly overvalued and tied into one sided agreements. A subsequent sale has been privately agreed ewhere] and they have demanded full fees based on the massively overvalued figure. I have been told by my solicitor that there is nothing I can do about it. All I can do is pull out of the sale as the fees would cripple me financially"
"..all the warning signs as outlined were clear to see, and a direct copy of original SBS tactics; gross over valuation of the business, total disregard for any trading accounts based valuation of the business, promises of waiting clients eager to view my specific type of property, a prediction of sale within 8 weeks, a non refundable buyer deposit of 10% to be lodged with my soliciter upon acceptance of offer, completion of total sale 6 – 8 months…"
There are thousands more just like the ones above. So how do you find a good, trustworthy broker? 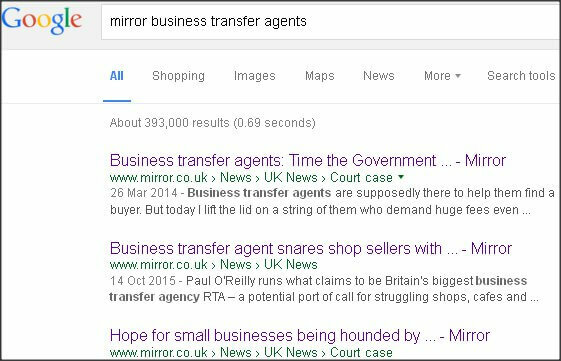 You could always research a specific broker using the broker’s name in a Google search together with terms such as “review" or “feedback”. Be aware though that it's not a very efficient way of flushing out a particular broker’s feedback, and Google search results can be manipulated by Search Engine Optimisers (SEOs) and "reputation management" companies. When searching for business brokers in Google the top results are not necessarily the best brokers, they are the brokers who have spent the most money or effort on SEO. There are also numerous review sites and feedback sites worth exploring. ​Bear in mind that at some review sites it's not impossible to manipulate feedback for your company (or your competitor's). For a few of the main business brokers in the UK we've put together our own consolidated reviews to save you visiting hundreds of different review sites. So many clients of brokers have been exploited by their brokers that some have taken the time and trouble to create entire websites just to document their experiences.They are often good sources for real-life experiences involving individual brokers. Then there's CEBTA. CEBTA can help if you've been a victim of a business broker. CEBTA's focus is on helping clients who have grievances against a few specific agents such as RTA, Ernest Wilson, Meridian, Knightsbridge and Hilton Smythe. Their site provides advice on how clients of these firms can possibly extricate themselves from their broker contracts or otherwise limit their losses. CEBTA is also attempting to gain legislative changes that'll impose regulation on the business transfer industry. I maintain probably the UK's largest database of business brokers, business transfer agents and a whole host of other intermediaries who provide the same service but go by different names. Included in the database is detailed profile information on these firms - their modus operandi, the sectors / industries they specialise in selling, the fees they charge, the geographical area they cover, what previous clients have had to say about them ... and much more. Engaging the right broker can give you a 500% better chance of selling your business and gain you between 50% - 200% more on the price you get. This page tells you about the service we provide to assist you with the broker choice, and here are some case studies of clients I've matched with brokers. Contact me if you want my assistance or have some questions you'd like to run by me. Click the button below if you'd like to enquire about our service of matching you with the right broker for YOUR business ... and getting you the right price and the right terms. Whichever broker you're using, we can probably save you several thousand pounds in fees and costs. In some cases we've saved clients six figure sums (read our case studies and testimonials)! ​We can tell you whether a broker is the right choice for your business and guide you to the right brokers. We can also give you unbiased advice on the alternatives to brokers. 100% Confidential.